Not everyone thought Moses should be the leader. Korah and his followers challenged Moses’ authority, and ultimately got swallowed up by the earth. 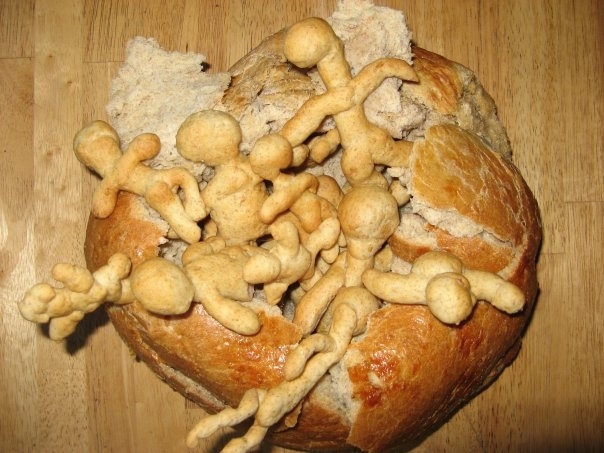 Here we see a split-open mound of challah earth, with Korah’s followers falling in. God punished Korah for his inability to channel his anger into productive protest. Following the deaths of Korach and his followers, Aaron stands between the Angel of Death and the Israelites. We must differentiate between our wants and our needs.